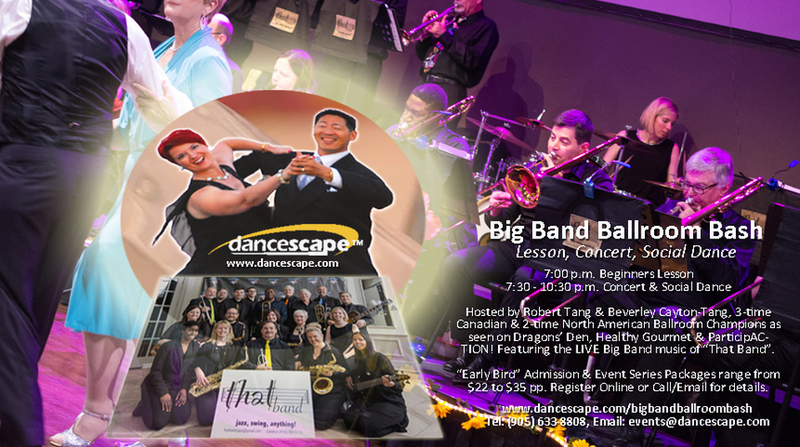 danceScape is pleased to present “Big Band Ballroom Bash” (Lesson, Concert, Social Dance), now in Oakville. Experience a fun Ballroom/Latin Beginners Dance Lesson from 7 to 7:30 p.m., followed by LIVE Big Band/Latin music presented by “That Band”. Register online ABOVE or call 905 633-8808 today! Hosted by Robert Tang & Beverley Cayton-Tang, 3-time Canadian and 2-time North American Ballroom Champions, as seen on Dragons Den, Healthy Gourmet and ParticipACTION’s “Get Inspired. Get Moving” fitness campaign. ​For danceScape Ballroom, Salsa/Latin and Wedding Dance lessons in the Oakville, Burlington and Milton areas, please see www.dancescape.com/lessons.